Golf Tamers - We are Here for the Golfers. My name is Mike Cuthbert from Dallas Texas, and I have been obsessed with Golf for as long as I can remember. My parents said that even at a very young age I wanted to watch golf on television over some cartoons. Now you would think this obsession would lead to me being as good as Tiger Woods but sadly a back injury decided otherwise. Growing up I lived in a small town in New Zealand where I could ride home from school on my mountain bike, grab my golf clubs, and head off to the practice area. Fortunately I was also able to caddie for the local pro golfer who also gave me some private lessons so I learned a lot from that experience which helped me immensely in my game going forward. At 12 I was playing off a 14 handicap, I won a few tournaments in both the junior category and combined category. I remember winning a cask of wine in one of the twilight golf tournaments I played in, however being so young I was unable to keep my prize. My golf was improving and things were going great until I crashed my bike one day and ended up with a severe lower back injury, while this halted any chance of a professional career, I am still able to get the odd round in and enjoy a game of Putt Putt or two. Thanks for taking the time to visit my website, due to not being able to get out on the course I have found building this website to be very therapeutic in the sense I still feel I have something to give to the golfing community. I am here for the Golfers. Not just any Golfer – but those who want to truly shine out on the course. To help you achieve that goal I have investigated ways to improve your swing, up your game and make sure you hit the green every time. GolfTamers.com presents this information to you in the form of ‘How To” articles and reviews that will have you ready to seize the day. 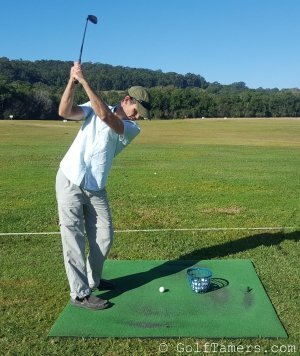 My ‘How To’ articles are designed to help you make the most of the various equipment available to improve your golfing experience. On the other hand, the review articles aim to give you all the information you need to make an informed decision about various pieces of golfing equipment before you make the decision to buy. While I do not personally own every product you will find on the Golf Tamers website, you can trust that I have been as thorough as possible in my research. We have searched the internet for reviews from verified customers as well as considered the information available from the company website. The result is a review that I hope will be helpful to you in your search for information – just remember, any opinions expressed here are my own. Your goal is perfection on the golf course, my goal is helping you achieve it.